Even given the increasingly polemic rhetoric of politics, the latest anti-Obama billboard to sprout up is pushing the boundaries of good taste. It’s also accomplished the rare feat in that it has both the Republican and Democratic parties united in universal disapproval of the billboard, its message, and it’s caricatured drawings of the President. 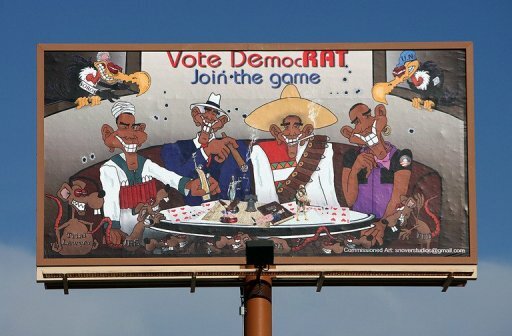 The billboard in Grand Junction, Colorado, depicts Obama as an Islamist suicide bomber, a homosexual, a Mexican bandito, and a gangster, as well as with rats labeled as one of four different wings of the executive branch of government. The caricatures are the work of Paul Snover, an artist who frequently contributes cartoons to various conservative websites. Neither he nor the owner of the billboard, Dennis Lucas, will say who commissioned the sign. Remember when billboards just showed ads and didn’t cause problems?